So, we headed inland in the pouring rain. After driving through the tree I knew that the 101 was next. I wanted to avoid any major roads so we took a look at the map. “Avenue of Giants.” It sounds like I should know what that is... hmmm. Let’s check it out. You might want to hit play and listen to this as a background. My car is in no way this loud, but the tone is the same. I love it. I feel like we might be in a fairytale. Given the time of year and the downpour of rain there was no one around! It was amazing. In some areas it actually looked fake. Condor looks like an RC car. It was amazing. Gratuitous car shots, thankfully this is a car blog. We spent the next couple hours meandering along this road and taking other side roads to avoid much of the 101. We stopped and had lunch at a campground surrounded by these giants with no one else around. That was my favorite moment of the trip so far. Standing under a small park overhang to stay out of the rain. Surrounded by giant redwoods. No sounds except for rain. No one except for her. Condor sitting there happily, almost looking proud of himself for how far he’d come... I dumped in another quart of oil and we headed back to the coast and Eureka. I like California, obviously, but it was nice to get to Oregon! This was now all new road to me and I couldn’t wait to see what it looked like. Sneaker waves are like landsharks. Never let them in. How would you like to live at this light house. Yikes. As you drive along it’s startling how rugged the coastline is up here. Treacherous for any ships, that’s for sure. We found a local brewery on a side road and decided to stop. The tasters were good! It’s a very small brewery and it’s so remote that they said none of the bottling or canning companies would travel all the way to them. So, they sell it in keg or growler form only. So after the short tour and explanation of how it all works, I need to start home brewing, we asked him where a good place to eat is. Who would think that this little shack called the Hunter Creek Bar and Grill would be the best meal of the trip?? It was. Nothing fancy, but it was fresh, delicious and dirt cheap. We both looked at the bill and realized it was about half of what a really bad burger and fries had cost us at our last stop in California. Welcome to Oregon prices. WOOHOO! So, we continued putting up the coast. On a small “scenic” sideroad we saw this. Simple, but it looked clean and it was on the beach so we decided to check it out. Perfect, we have our home for the night! The beach is empty, as we’ve gotten used to. It looks like a painting. Thankfully the wife is a great photog! Picturing this big of a tree on the beach blows my mind. How long ago was it here? Looks like it was saw cut. hmmm. 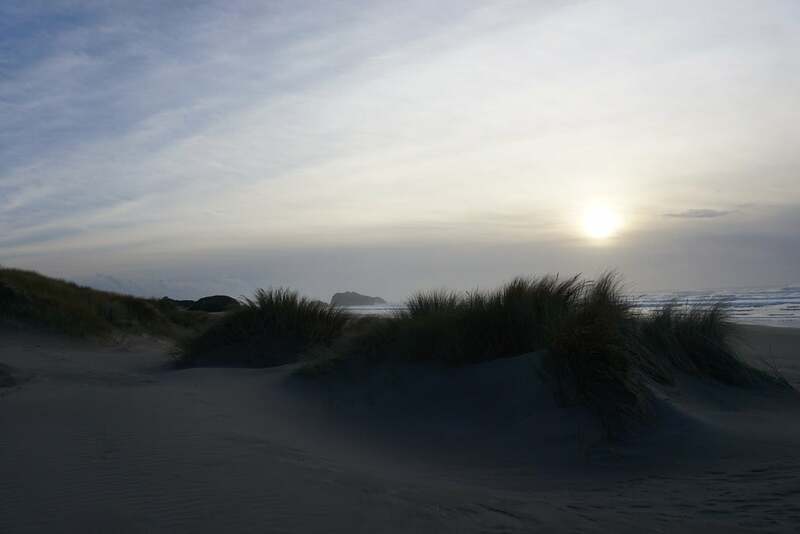 Bandon, Oregon. Go there, it’s rad. Next up, we dodge some storms..... What could go wrong?? ?